This option enables the users to route the DMS item. 1. From the Document Control tab, select the DMS Item to be routed. 2. Click Start Routing. The “Start Routing” popup window is displayed. 3. Select the routing process from the Select Process dropdown list. 4. To make the selected process as the default, select Is Default process for Selected Item checkbox. 5. Enter any notes in the Comments field. 7. Click Save. This changes the status of the work item to In Work in the Revisions tab and a mail is triggered to the approver as shown. 8. 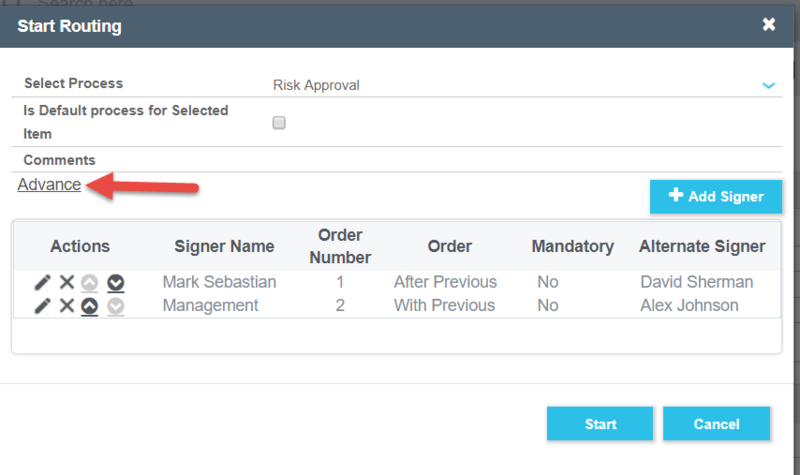 The approver can click Sign to approve or reject the document. The e-sign page is displayed. Note: As per the 21cfr part 11, you cannot save the Username and Password to sign the document. 9. Enter the username of the approver in the Username field. 10. Enter the authentication code in the Password field. 11. Select the status of the work item (Approve / Reject) from the Status dropdown list. 12. Enter the reason for approval or rejection if any in the Comments field. 13. Click Sign. Once approved, the status is changed to Approved. Note: If there is another level of approver, an email is triggered to the next approver and the approver has to sign it to complete the routing process. Also, cover letters are generated at each stage during the routing process.